We would range in age from 17 to 83. Mom likes to plan everything in advance. We, our children, and Aunt J. are more spontaneous — inclined to discover things as they come along. In Todos Santos, an hour north of Cabo San Lucas on Baja’s Pacific Coast, quaint, largely unpaved colonial streets form a quilt of shops, galleries, fine restaurants, and hideaway dwellings. Unexpected delights await you even on a casual stroll — the late afternoon sun filtered through a mango grove or a hidden courtyard where vines have been trained to grow in basket-weave patterns. 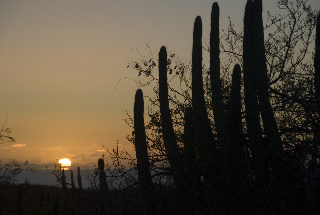 The Mexican Tourist Board calls Todos Santos “Pueblo Magico” or “Magic Town.” And with reason. From Cabos, Todos is a popular day-trip destination, and one I’d recommend. Long renowned for its pristine beaches and excellent surfing, the town has recently gained a reputation as an artists’ colony and a community where you can find anything from off-roading opportunities to Tai Chi classes. Visitors often head for the cinnamon-colored Hotel California, whose owner floated a famous (and since debunked) rumor that it inspired the Eagles’ song of the same name. Featuring one of the community’s largest and most esoteric collection of local crafts, it is a popular gathering place and also happens to house one of the town’s best restaurants. There are several excellent ones to choose from, including Café Santa Fe and Los Adobes — where we enjoyed a sumptuous patio lunch. They provide a gourmet take on authentic Mexican cuisine, incorporating locally grown organic ingredients. Feeding Todos Santos’s stature as a haven for artists is its assortment of galleries, an annual February Art Festival, and an emerging Film Festival, too. In the galleries as well as in many shops and restaurants, you’ll find a variety of painting, photography, and sculpture — from traditional to avant garde. In addition to the high-profile artists with galleries in town, many others work and exhibit in their homes. It could, we considered, be a formula for discontent. But we were all looking forward to some quality "together" time, and the allure of a week in a villa overlooking Cabo San Lucas, Mexico proved significantly persuasive. As it turned out, we needn’t have worried. With ideal accommodation and the town’s splendidly varied offerings, we enjoyed a glorious week of good food and fun and were able to effortlessly accommodate our different interests and travel styles. Our adventure began — and anticipation built — as our driver bounced his van over the winding cobblestone streets of Pedregal, an upscale community overlooking Cabo. The medieval road was somewhat at odds with the striking adobe-and-glass showplaces and cacti landscaping, which dotted the hillsides. Soon we arrived at Villa Paraiso Del Mar, an intimate yet spacious, airy dwelling with four bedrooms. restaurants, made reservations, and decided upon day excursions. Sportfishing? Check. Day trip to Todos Santos? Check. Enough time to chill out? Check. The rest of that first afternoon we spent settling in, lounging in the infinity pool, and enjoying the Pacific view from the rooftop balcony and through the glass walls, which opened up to let the balmy outdoors in. Our first night in Cabo suitably began with dinner at Pancho’s, a sprawling, festively decorated patio overflowing with spirited diners of all ages and a flurry of waiters, who, toting margaritas, threaded their way to and from the tiny bar. Pancho’s offers 500 different tequilas (the world’s largest selection), including a prominently displayed jug containing a rattlesnake. Everyone enjoyed a satisfying meal full of Mexican sabor, with lots of yellowtail, bacon camarones, and for the teenage boys, exceptionally tender steak. Strolling mariachis, a troupe of dancers and street percussionists, and a horse and carriage all heightened the party atmosphere. Welcome to Cabo. With its unsurpassed reputation for sport fishing, we couldn’t resist a 5-hour excursion that would not only give us a chance to catch dinner, but offer stunning up-close views of the famed El Arco (The Arch) forming the peninsula’s tip. We were not disappointed. Our captain, Manuel, steered us in a steady path as Miguel baited our lines. Within a few minutes of rounding El Arco, a line jerked, and we had a marlin grabbing air 60 feet away. Miguel reeled frantically, but it escaped, leaving us only memories of its impressive gymnastics. Soon a school of dolphins, diving playfully in pairs, surrounded our boat. A grey whale announced its presence with an airy blast, arching its back for a photo or two. Before long, we were all mesmerized by the sun and waves… and the motionless fishing lines. Suddenly one began to flick back and forth, and Miguel pounced on the reel, gathering it in as he positioned my son in the swivel chair. 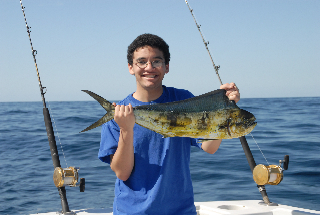 The two of them fought spiritedly with a feisty dorado, finally landing it and giving my son the thrill of the week… not to mention the entrée for our barbecue feast that night. As we chugged into the harbor at trip’s end, Miguel couldn’t resist having some fun with the local pelicans, luring them onto the boat with leftover bait and unceremoniously throwing them off the back deck. For the non-fishing enthusiasts, Cabo offers many diversions– from a day trip to the town of Todos Santos (see sidebar) to search for silver jewelry and native crafts, to jet skiing, parasailing, and snorkeling. Plus Cabo’s many fine and varied restaurants make dining a delight. Our most memorable culinary experience came at Pitahaya’s, an elegant beachside restaurant at the Hacienda Del Mar Resort. A few miles out of town, it features sumptuous Asian fusion cuisine. Covered by a towering palapa, Pitahaya’s impressed with both the quality of the food and creativity of its presentation. A coconut-chipotle shrimp appetizer arrived on a thick glass brick, a Caesar salad in an edible cheese bowl, and a sherbet dessert inside a chocolate shell. Mom loved the scrupulous attention to detail, and the kids loved the succulent steak. Perhaps our definitive Cabo experience, though, involved lunch at The Office and an afternoon at Medano Beach, a kaleidoscope of people and activity. Throngs of strollers and vendadores — offering everything from sombreros to henna tattoos — picked their way through hordes of sunbathers and past tables plopped on the sand under beach umbrellas. An armada of rental jet skis launched and landed. Overhead, the colorful chutes of parasailors filled the sky, and on the water, glass-bottomed boats ferried snorkelers to El Arco. to the closest one, as our sons discovered to their delight. Before coming, we’d worried there might be too much compromise to make the vacation a success with such a broad range of ages and interests among us. But with Cabo’s excellent restaurants, our comfortable villa, and such a great variety of things to do, we’d hit on a winning formula. Earth, Sea and Sky Vacations offers a range of villas in and around Cabo, from around $450 a night to $6,000+ for a 15,000 sq. ft. palace that can sleep upwards of 20. Based locally, they provide concierge services for anything from ground transportation to catering, spa services, golf and fishing packages and restaurant reservations. (800)745-2226; www.cabovillas.com. The Office, on Playa Medano, open 7:00 a.m. to 10:00 p.m. daily; reservations (624)143-3464.